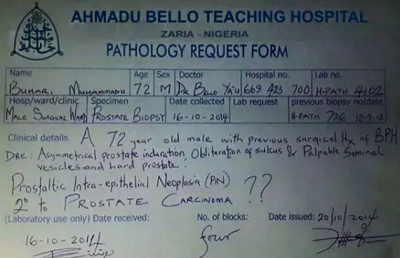 The Ahmadu Bello University Teaching Hospital (ABUTH) Shika, Zaria, has discredited the purported medical report said to have emanated from the hospital indicating that General Muhammadu Buhari (retd) was diagnosed with prostate cancer, the Buhari campaign office said. 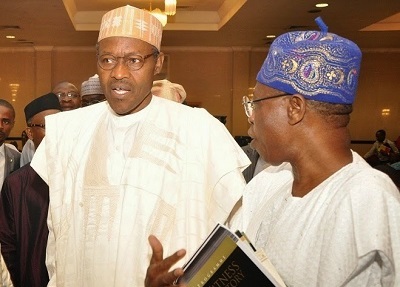 The All Progressives Congress presidential campaign organization, in a statement by its media and publicity director, Malam Garba Shehu Saturday, described as disdainful, distractive, mischievous, fake and fallacious, the trending news report of an alleged prostate cancer condition of its presidential flag bearer, Buhari, being credited to a source from the renowned Teaching Hospital. The campaign organization added that “this is the highest point of political distraction, malice and mischief. The report was not only fake but unfounded. I have spoken to impeccable sources at ABUTH all of whom deny the report and also claimed that the letterhead used was not their regular one, and that Dr. Bala Mohammed that purportedly approved the false Medical Report is not on the personnel list of that department”. The Buhari campaign spokesperson said “sources at ABUTH also disclosed that “Medical Report analysis only come from Laboratory Technologists and not Medical Doctors as handwritten in this particular case, stressing that General Buhari did not attend the hospital for cancer or any other ailment”. The campaign also dismissed as figment of the imagination of “wicked and evil persons”, rumours that Buhari may be travelling to the United States towards the end of this month for medical check-up. The statement, while dismissing the report as fabrications, however, said that “as a prominent leader of the opposition, many interests across the world want him (GMB) over for political and diplomatic consultations”, adding that the “invitation to the US may not be unconnected to this”.